The yard at the Bialik school is smaller than the standard baseball field, nevertheless Shai and his friends are happy to be outside swinging bats and catching balls. What makes this group of youngsters different from most Israeli fifth- and sixth-graders are that they are children of foreign, or guest, workers. Shai’s parents, for example, are from the Philippines and work as caregivers for elderly Israelis. His friend Miklas is from Eritrea. 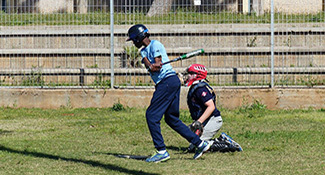 They are learning to play baseball as part of a special program at Bialik that caters to children whose parents have come to the country for temporary work or refuge. More than 80 percent of the 750-plus students in grades K through 12 at Bialik are children of foreign worker. According to Bialik principal Eli Nechama, there are around 300,000 foreign workers in the country, a number that includes both legal and illegal workers, the majority from the Philippines, West Africa and Romania. About 70,000 of them live in Tel Aviv, most in the seedy lower-middle class neighborhood where the Bialik school is located. Children of foreign workers are often not registered with the municipality so their numbers are hard to track. Israeli law mandates that any child who has lived in the country for three months is entitled to basic education, health care and welfare. Bialik’s students include not only the children of guest workers but new immigrants and refugees, too. “The Bialik school gives them a feeling of belonging,” notes Nechama. “Their parents work long hours as caregivers, and at menial tasks in restaurants and supermarkets. The school provides a place to go. And sports offer foreign workers’ children the opportunity to interact. Miklas steps up to the plate. The thin, muscular sixth-grader slams the ball, running the bases while the other team scrambles to catch the ball in the outfield. “A home run!” one of his teammates yells. Another jumps up and down, shouting “Yesh”—an Israeli expression of affirmation. Then Sami, an 11-year-old from Ghana, steps up to the plate and hits the ball into the outfield. He makes it to first and starts for second but, realizing he won’t make it, tries to get back to first and is tagged out. “You didn’t stand up for me,” Sami answers, scowling. The students only began learning the game last year as part of an afternoon enrichment program and sports curriculum. These kids will continue the program next year, too. 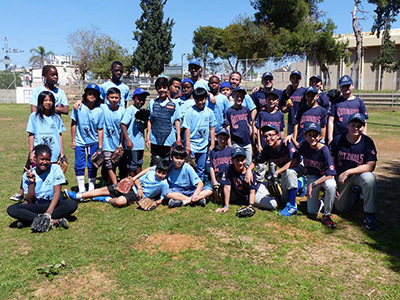 By the time the kids are in seventh grade, says Katz, these kids will be integrated into the Israel Association of Baseball’s Tel Aviv team and be able to play in the country-wide league. Until that time, they have a chance to gain confidence as well as play against other local school teams. The issue of identity is tangible for these children. They imbibe Israeli culture yet, since they and their parents are not citizens, they live on the edge of Israeli society. “They know that they are not Jews, and their parents live in fear of deportation,” says Katz, about those in the country illegally. And yet, many have lived in Israel for years. They speak Hebrew fluently, and live by the Jewish calendar. Eustice, a tall, thin girl from Nigeria, waits for her turn to bat. She has been in Israel for eight years. “My father’s lived here 11 years,” she says, “but I want to go back home.” She describes the hostility that many Israelis who live near Bialik have expressed toward the foreign workers, accusing them of selling drugs and increasing crime in the neighborhood. The Bialik school’s focus on nurturing a sense of belonging in its disadvantaged student population derives from just this type of antipathy. And its sport program provides a welcome respite from the worries these children face, as well as an outlet for youthful fun and exuberance.